The weed killer dicamba is drifting from fields and destroying crops. Sharon and Kelvin Dordon of Bernie, Mo., say their tomatoes are among the casualties. Broadleaf plants flinch at the slightest drop of dicamba, which the EPA has approved for use on genetically modified soybeans and cotton. Every August, Andrew Joyce used to hunker down in the field beside his house, picking juicy, ripe tomatoes in the blazing sun. 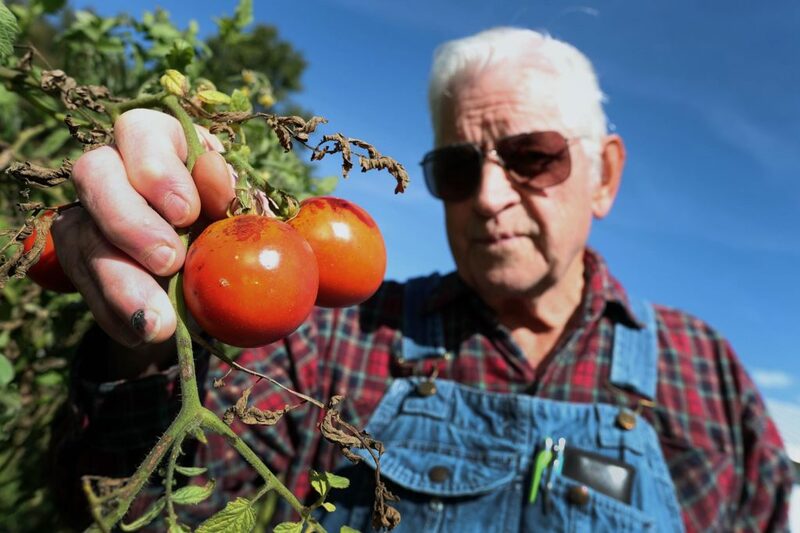 He’d load them onto his golf cart, along with buckets of okra, squash and other summer crops, and zip over to the farm stand he runs with his wife, Sara, off a two-lane highway near the Arkansas border. Sara’s Produce fans would drive hours to stock up on the artisanal fare, grown amid the fields of soybeans and cotton that reach toward the horizon of Missouri’s Bootheel. “Everybody brags on my stuff,” said Joyce, 58, a wistful pride crossing his bronzed, weathered face. But now, he has nothing to sell. Joyce leans against the greenhouse he’s building, hands in the pockets of his overalls, peering at the field where he started nearly 800 tomato plants in the spring. It was early August when the telltale signs of trouble emerged. The plants’ broad, flat leaves shriveled and curled, their branches twisted and buckled. Then blossom rot set in. Joyce knew they couldn’t be saved. He climbed onto his tractor and mowed down his bestselling crop – for the third year in a row. 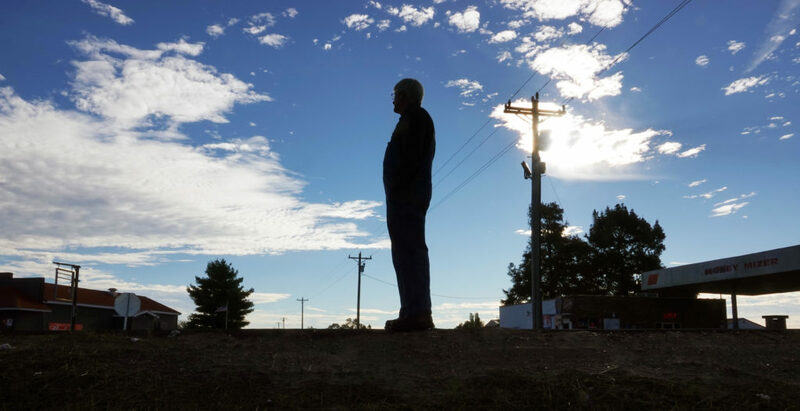 The plague that struck Joyce’s farm in Malden, Missouri, was not a natural disaster, but a man-made weed killer called dicamba. Farmers had applied the drift-prone chemical sparingly for decades. But in the past two years, its use has grown exponentially, and now dicamba is destroying millions of acres of crops worth millions of dollars, pitting farmer against farmer and scientists against manufacturers. A joint investigation by Reveal from The Center for Investigative Reporting and the Food & Environment Reporting Network has found that the U.S. Environmental Protection Agency – which is required by law to ensure pesticides don’t impose unreasonable environmental and economic costs – could have averted the destruction. Two weeks ago, even though dicamba is causing widespread damage to crops and wild plants, the EPA approved the weed killer for another two years, stating that new label instructions will minimize the harm. The agrochemical giant Monsanto Co. orchestrated the massive deployment of dicamba on tens of millions of acres of crops in the Midwest and mid-South when it lobbied the EPA to allow the chemical to be used on its genetically modified seeds for cotton and soybeans. The seeds – which the company engineered so that farmers could use dicamba to kill invasive weeds without hurting their crops – were worth $3 billion last year. Issues with dicamba began to emerge under the Obama administration, which approved its expanded uses on a trial basis in late 2016. But even though the problems proved dire, President Donald Trump’s administration agreed twice to approve its use until at least the end of 2020. As farmers sprayed these crops in 2017 and 2018, scientists estimated that dicamba had damaged nearly 5 million acres of soybeans in 24 states, mostly Arkansas, Missouri, Tennessee and Illinois. (No one tracks damage to specialty crops such as tomatoes or home gardens, trees and wild plants.) Only two crops have been engineered to resist dicamba: soybeans and cotton. 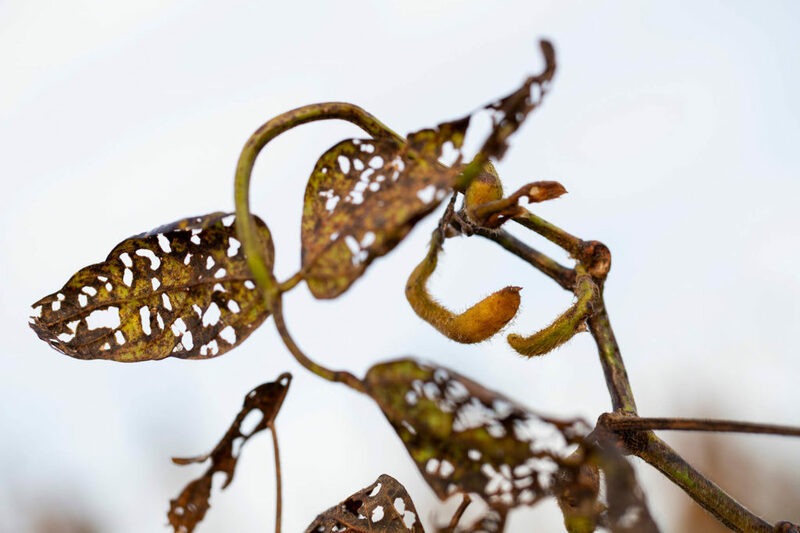 Every other broadleaf plant, including non-genetically modified soybeans and cotton, is at risk. David Mortensen, an agricultural ecologist at the University of New Hampshire, is among the most passionate and vocal critics of allowing dicamba on genetically modified crops. Beginning in the 1960s, farmers had tended to spray dicamba only in late winter or early spring. In cooler weather, the chemical has less chance of evaporating, drifting through the air and harming other crops. But a biochemist’s discovery 21 years ago ultimately would shatter those best practices. The biochemist, Donald Weeks, filed a patent on the gene in 1997. A worried Mortensen funneled his energy into research on dicamba while Monsanto developed Xtend seeds and a “low volatility” dicamba formula that wasn’t supposed to evaporate from fields and migrate through the air. Monsanto, however, told the EPA that weed resistance to dicamba was unlikely. It had made a similar argument in the early 1990s when it petitioned regulators to approve its new Roundup-resistant soybeans. Weeds wouldn’t evolve resistance, Monsanto claimed. But Monsanto was proven wrong when scientists documented resistance to Roundup two years after the genetically modified seeds hit the market. The company also assured the EPA that there was “no concern” about dicamba products drifting and harming other crops. That claim also was quickly proven wrong. Yet the EPA repeatedly sided with Monsanto over the objections of Mortensen and other university scientists, first by registering dicamba in 2016 and then by keeping it on the market. In addition, the EPA registered the weed killer with an inordinately complex instruction label that disregarded its tendency to evaporate and spread through the air – ultimately shifting the blame for drift problems to growers and applicators. During the 2017 growing season, when several million acres of crops were damaged by dicamba, the nation’s top weed scientists formed a special committee to help the EPA avoid a similar disaster in 2018. But the Trump administration instead focused on salvaging dicamba. The EPA announced new rules for spraying in October 2017 and again last month. In both cases, the agency said the changes would minimize drift. Yet the revised labels are even harder to follow – and do not ensure that dicamba won’t vaporize off fields. Documents show that Trump’s EPA relied mostly on Monsanto’s advice last year when it decided to change the instructions on the label rather than restrict its use. “Our expectation was for you all to send the EPA your proposed label changes,” Reuben Baris, acting chief of the herbicide branch of the EPA’s Office of Pesticide Programs, emailed top executives from Monsanto, along with dicamba manufacturers BASF and DuPont Co., last year. EPA officials declined to answer specific questions. Use of the herbicide is ratcheting up tensions in farm communities, even costing one man his life. A 55-year-old Arkansas soybean farmer died in October 2016 after a man he confronted over dicamba drift shot him. The man is now serving a 24-year sentence for second-degree murder. Bees from Bobby Coy’s hives once pollinated neighbors’ farms. But now, Coy, who runs Coy’s Honey Farm with his wife and two sons, said they might leave Arkansas because those neighbors are spraying dicamba and bees don’t feed on dicamba-injured plants. Coy will be 81 in a year and a half, when he’ll have paid off the $360,000 the family owes on the building where they extract honey. The EPA denies that hives are at risk when dicamba is used according to the label instructions. Those official complaints miss most of the damage. Many people don’t file complaints for fear of jeopardizing insurance claims, which typically address sprayer errors, not problems with the product itself. Growers think they either can’t live with dicamba or can’t live without it, said University of Arkansas weed scientist Jason Norsworthy. “I’ve been in this discipline for nearly 20 years and I’ve been in agriculture all my life, and I’ve never seen anything as divisive,” Norsworthy said. 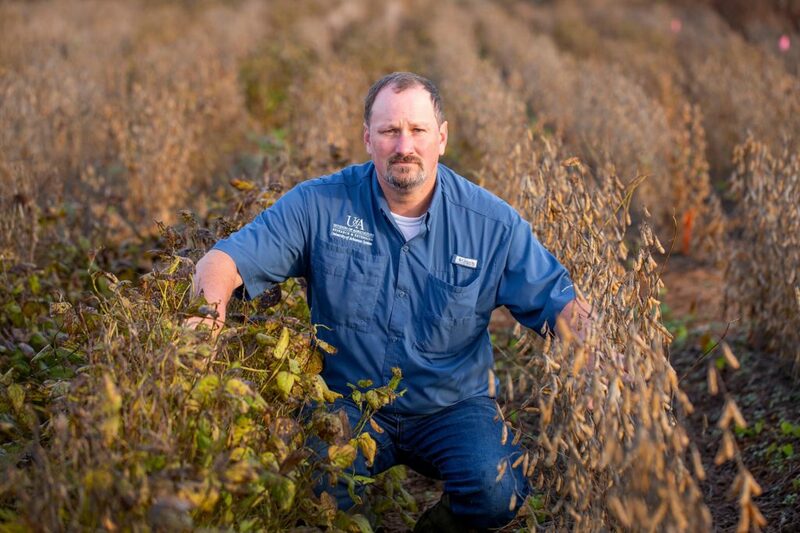 For soybean farmer Perry Galloway, dicamba is the only thing that works against his nemesis, the pernicious pigweed. Galloway and five other farmers filed a lawsuit challenging the Arkansas ban last year. Galloway, who planted 4,500 acres of dicamba-resistant soybeans last year, said he hasn’t seen drift problems other farmers have complained about. Bayer Crop Science, which took over Monsanto in June, said dicamba complaints have dropped dramatically in the past year because applicators now are better trained. The company declined requests for interviews. “Our customers tell us they’re seeing some of the cleanest fields in years and that they’ve had successful on-target applications of XtendiMax over broad acreage,” Bayer spokeswoman Charla Lord wrote in an emailed statement. But Norsworthy said education and training will not fix a pesticide that doesn’t stay where it’s applied. “Our commercial applicators did not wake up last year and forget how to spray,” he said. Monsanto was well aware that the chemical’s propensity to drift could imperil its chances of EPA approval. In a 2013 meeting with investors, Monsanto’s chief technology officer, Robert Fraley, said its new formula, XtendiMax with VaporGrip, “basically reduces the volatility to zero,” meaning that the product never would drift to unintended crops. Even so, Monsanto executives met with top EPA officials, notes from a February 2016 meeting show, to learn what would be needed “to create a defensible approach” to the concerns about drift. That solution involved submitting studies that the company claimed proved XtendiMax was safe. Monsanto told the EPA that its research provides “multiple lines of evidence (to) demonstrate that there should be no concern of off-site movement due to volatility.” The company also reported that there was no need for a buffer zone to protect other plants as long as applicators used a specific spray nozzle. But it turned out that these studies didn’t capture what happens in actual fields. In one type of study, called humidome experiments, soil is sprayed, then covered with plastic to measure how much turns to vapor. “One thing we’ve learned this year, there is not a correlation between humidome data and what we see in the field,” Norsworthy told growers last year. Monsanto also submitted field studies to support its claims. But the studies were not done in Arkansas, Missouri or other places where extreme summer heat favors vaporization. And they were too small to mimic the effects of applying the weed killer across vast acres, which loads the atmosphere with the chemical, making it more likely to drift, Mortensen said. He called the company’s studies “shockingly insufficient” in a statement supporting a lawsuit that rural farmers and environmental advocates filed against the EPA last year. Monsanto refused to let independent university scientists test its product’s ability to drift before it hit the market in 2017. Then Norsworthy, University of Arkansas weed scientist Tom Barber and colleagues in other states quickly got to work. They mapped wind direction and damage to neighboring fields after spraying. They took greenhouse plants to fields a day after spraying and covered some with buckets during spraying. The results were consistent: Even when dicamba is sprayed exactly as directed, it evaporates over several days and damages plants. The scientists told EPA and Arkansas officials what they’d discovered in the summer of 2017. But that same day, a top EPA official assured dicamba manufacturers that the agency is “working in partnership with our state regulatory colleagues to overcome any potential hurdles in the state registration process,” according to emails released through litigation. The EPA didn’t listen. But an Arkansas task force did. The panel recommended prohibiting dicamba applications on crops after April 15, when the risk of damage is greatest. Monsanto fought Arkansas’ proposed ban, claiming it was based “on unsubstantiated product volatility theories.” Monsanto also attacked the scientists, accusing Norsworthy of endorsing a competing product. This, his university employer insisted, was not true. Many of Norsworthy’s colleagues expressed outrage at Monsanto’s attempt to discredit one of the nation’s most respected weed scientists, though they would not speak on the record about it. Now it appears that dicamba’s benefits to farmers trying to kill weeds could be short lived: Pigweed can evolve resistance to the chemical in just three growing seasons, Norsworthy’s research shows. It’s just a matter of time, he said, before weeds survive dicamba, rendering it useless, just as he and other scientists warned. Meanwhile, more farmers are buying the genetically modified seeds in self-defense. In the 2018 growing season, acres planted with dicamba-resistant crops doubled, accounting for more than half of the 90 million acres of soybeans grown in the United States. 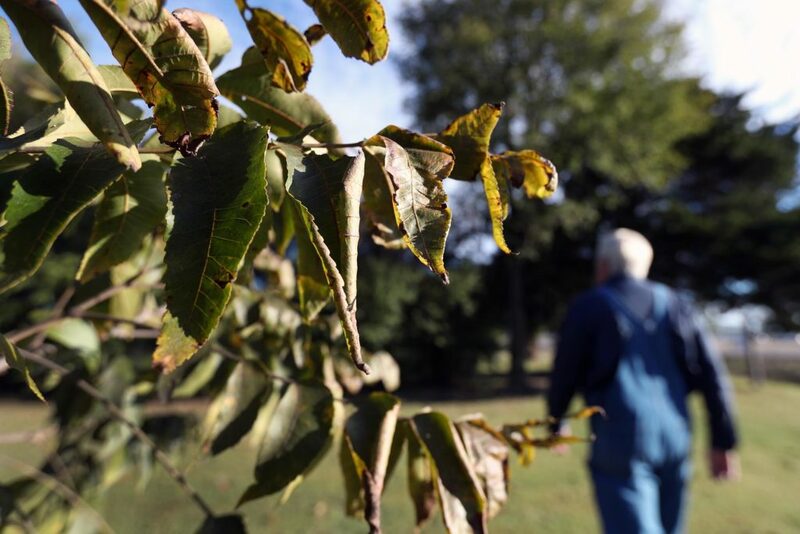 This time, most complaints about damage came from small farmers like Joyce, beekeepers with plummeting production and master gardeners with nothing to harvest. Joyce isn’t sure whether he will grow tomatoes next year. He’s not sure he can continue farming at all. 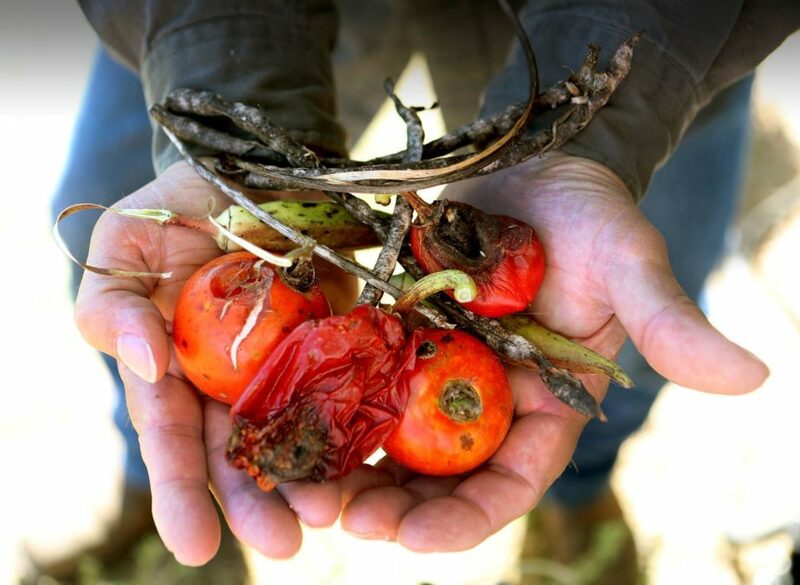 Looking around at his blighted vegetables, trees, rosebushes and flowers, it’s hard for him to grasp the scale of the destruction that dicamba has caused throughout soybean country. “I don’t see how they can allow anything to go on damaging that much stuff,” he said. This story was edited by Marla Cone and Kevin Sullivan and copy edited by Nikki Frick.